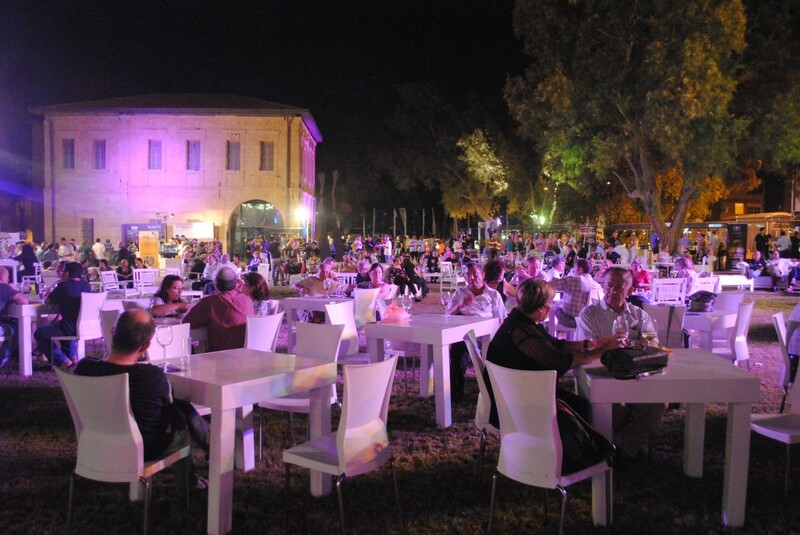 This past Wednesday and Thursday marked the fifth annual Salute Wine Festival in Be’er Sheva. Israel has no shortage of wine festivals and expos, but rarely do we get a taste in the South. With over 300 wineries in the country, Israel’s wine industry is rapidly growing both in size and international prestige and we were fortunate to have somewhere in the neighborhood of 30 wineries from around the country represented. Set outdoors between the Negev Museum and the Ottoman Mosque in the Old City, the atmosphere – complete with live music – was lovely. A reasonable NIS 50 (about $13.50) per night got each participant a tasting glass, and everyone strolled around sampling the many wines (each winery had about six wines each to try). In addition to wine there were also two cheese stands from local dairy farms and a hot dog stand selling sausages, empanadas, and oversized kosher pigs in a blanket. Many of the big name wineries, such as Barkan, Binyamina, Carmel, Golan Heights, Recanati, Tishbi, and Galil were there and showing off their higher end reserve products. I was also introduced to many new wineries such as Kfir, Shamayim, Shiloh, Safed, Teperberg, and Kahanov, which all had some nice selections. Although not my thing, many of my friends thoroughly enjoyed the flavored liqueurs from Lavi Winery. In addition I was very happy to see a number of local Negev wineries being represented, including Rota (which you may recall I have visited) and Negev Wines. And, shock of all shockers, I learned that there is a winery in Be’er Sheva! It is I believe called Baarot (יקב בארות) and is a very small boutique winery operating essentially out of someone’s home. You can find it at the Friday Farmer’s Market in the Seventh Avenue Mall. The two cheese stands present were both also phenomenal. Kornmehl, which I have also visited, is about half an hour south of Be’er Sheva and makes delicious goat cheese. I was also introduced to a new nearby farm, Tzeela, which is about half an hour west of Be’er Sheva and makes sheep’s milk cheese. I enjoyed cheese from both stands each night and even brought back some of the Tzeela feta to enjoy at home. I believe that they have a stand at the Friday farmer’s market as well. If you didn’t make it this year then don’t miss out next time around. It’s well worth traveling for and is absolutely unmissable if you live in Be’er Sheva. It’s the culinary event of the year. SUCH a fun night!! Thanks for the recap! Love that first photo! Mmmmm I am not very big on wine drinking (I know.. terrible for a foodie, especially an Italian foodie!!! ), but the cheese stalls would have seen me all night long… hehehehehehe Beautiful pictures!!! Manu I’m shocked! 😉 Yes, you would have been very happy with the cheese stalls. I definitely visited them many times throughout the night. Great festival, even if I prefer beer (like Manu, a strange Italian :P)! Haha, you two crazy Italians! I also love beer. Last year there was supposedly some beer as well and I while I love wine my husband was disappointed that there was no local beer. Salute! WOW – looks so much fun. Love the outlook seating set up, just goregous! It really was a ton of fun! Just a lovely evening. And so nice outdoors (luckily it cools down in the evening here).